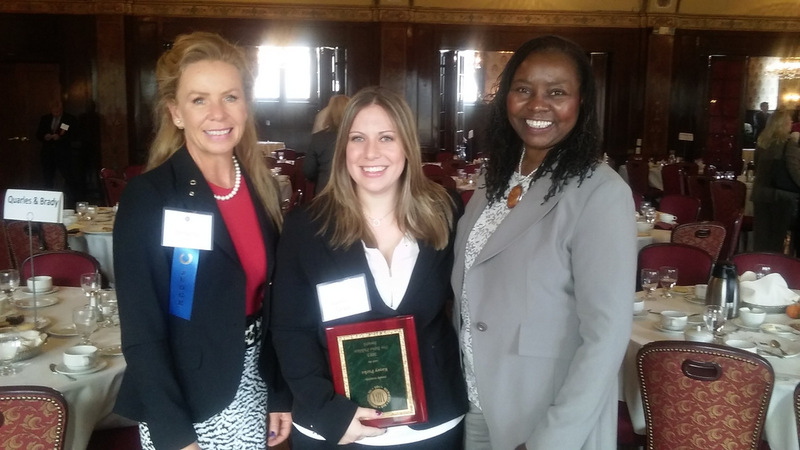 Kasey Parks has received the Milwaukee Bar Association’s (MBA) Pro Bono Publico Award in the category of law student. Kasey accepted her award at the MBA’s annual State of the Court Luncheon on Thursday, October 15th. The award is given to an individual attorney, an organization, and a law student based on the following criteria: developing innovative ways to deliver volunteer legal services or improve access to justice; participating in activities that improve legal services to the poor or increase access to justice; and working on legislation that increases access to justice. Kasey has completed over 150-hours to date. Most of her time has been given to the Marquette Volunteer Legal Clinics (MVLC). Kasey gives her time each and every week, doing what all practitioners should by making pro bono a habit in her busy schedule (Kasey is also completing her Master’s in Business Administration, is the Article and Research Editor for the Marquette Sports Law Review, and has been a volunteer and research assistant for the National Sports Law Institute for the past 3 years.). As a member of the MVLC’s student advisory board, Kasey is a leader among her peers. She reaches out to incoming students and explains how the life of a busy law student has room for incorporate pro bono. She is an important part of our legal community’s desire to give back. As a law student and future attorney, her service ethic and actions are key to the culture of pro bono among the legal community. Thank you Kasey. You are worthy of this recognition. (In the photo above, Kasey is pictured with Supreme Court Justice Annette Ziegler and Milwaukee County Chief Judge Maxine White).